ACL x Urban Outfitters | A Continuous Lean. A few weeks ago I went down to Philadelphia to poke around the Urban Outfitters headquarters and get all up in everyone’s business. The folks at URBN decided it was only fair to flip the script on me and come up to my apartment in New York and go through all my stuff. I have to admit the resulting pictures are pretty fun and semi-ridiculous at the same time. I mean, for a grown man to collect thermoses! You can see the whole photo essay here. Make sure you read the captions – there are some funny tidbits in there. Very nice. You have a very pure, honest focus that’s hard to find these days. I’m a fan. Loved seeing your home! And, of course, meeting Lancey too. Sweet digs my friend. Where did you hide your harem of women addicted to you and items proudly manufactured in the USA? Did you pick up the tumblers in Maine? Awesome apartment, but you should be ashamed about the plaid thermoses. Nice place. You hae some cool stuff. I really dig the old flag. One thing bothered me though…do you really keep your boots on the table? A good pal of mine back in Portland- straight as an arrow, beautiful wife and daughter- has an entire basement full of thermoses, plaid and otherwise. His collection is sort of unbelievable, and what’s not stored in the basement is displayed pretty tastefully in and around the kitchen. I thought he was the only one. You gave away your top secret project :) Should be great – cant wait to see. If there was moderation or logic attached to the thermos collection, it wouldn’t have been any fun. These compulsions are secrets we don’t know about ourselves yet, I think. Vadim K â€” good catch! I caught that too. When will this top secret project launch? 8-) I was guessing on what could it be – and after checking out you flicker set on that trip to the fabric and your orange canvas tweet came to the same conclusion. Have you started drinking gin, tonic and bitters yet? 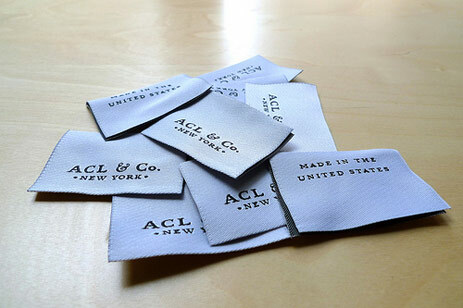 The ACL & Co. goods will launch at the end of the summer. Hopefully you guys will like them. If not, I will never need to buy another bag for the rest of my life. Great post. Your dog is fantastic. That’s how I picture myself living if I was still a bachelor. Just a lot, lot messier. You definitely brought in the cleaning lady before this photo shoot right? Don’t think you’ll have that bag problem. (Is there a waiting list?) How can they be anything but superb, since you’re in charge? The first book of Islands In the Stream is the greatest thing Hemingway has ever written. is that stanley flask the one they did for DWR? any idea if any of their nyc locations carried that stuff? love it. I like the Tervis tumbler glass. I have one with a tennis racquet, and I have one with an American flag. You have a very neat/clean apartment! – You’re very organized. I love dogs and springer spaniels are great/gentle with adults and children. I believe they are quite smart and learn quickly. I’ll be on the look out for your public announcement re the bag. Good luck. The great thing about collections, whether thermoses or, say, chalkware piggy banks, is that they donâ€™t have to DO anything except make you happy. Beautiful dog! Congratulations on a dynamite place. For some reason I’m very impressed with your desk chair. Nice one. Sweet set up you got Mister Williams. That flag is awesome. One question though – whats the deal with the Yankees fitted? nice digs! you have made me feel less bad about the absurd number of thermoses i own and never use (i may have been one of the few brides in history that registered for a stanley products). i also loved the story about your dog – any friend that sends you a puppy by plane is a keeper. hearing that you are coming out with a bag line just about made my day. i can’t wait! Re: Bags – So then it’s win/win, no matter how they sell. I love that you have boots on your table. Shoes on the table (which I know is a no-no), otherwise the dog will chew the shoes. And I’m not going back to Japan to get the good color way! VERY excited for your bag line!! I had a plaid metal lunch box when I was ten. I loved it more than anything. I thought it made me look incredibly sophisticated. Those thermoses bring it all back. About 20 years ago I used to carry a Klein 5139 bag as a clutch and my mother and I both agreed it had definite trend potential in that role. Dude- Nice flag. Like the way you have it on the wall. I have a Spanish Colonial flag that flew over the Castillo de Dan Marcos and have been saving $ for 20 years to have it framed. I still don’t have enough. nice spread indeed. we are brothers in corduroy. i was also at the last big meeting in brooklyn where author jonathan ames spoke. how did you get that most fantastic diploma? I know this post is a tad old, but I suppose I’ve been checking it/the comments from time to time because I’m curious: where will the fabrics and straps and things be made and the final product be manufactured? Which product are you asking about? The bags I am working on? All of the fabrics (with the exception of the Harris Tweeds) are made in the United States. The zippers are Riri and are made in Switizerland. There are no leather or straps in the construction at this point. Everything is being assembled in NJ. Perfect. Thanks! Yes, I meant the bags. I sincerely appreciate you taking the time to respond and I wish you the best of luck. I can’t wait to see them. I came across a collection of vintage leather bowling ball bags at a garage sale in Cleveland recently. I had to choose between a red plaid and a solid desert-brown leather with snap zipper. Glad to see I’m not the only one attracted to the plaid apparel of yesteryear.